NetFlix appears to have scored a major win, as they now have a two-year content deal with CBS. And while this is not a stake in Hulu’s coffin, it is an indication that NetFlix is probably going to continue to gain more traction among paying subscribers. 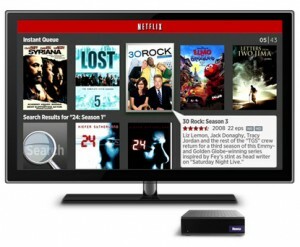 Roku streams NetFlix, which now has programming content from the CBS and ABC networks. To the average user, this may not mean much. But moving forward, more people are going to discover the Internet button on their new televisions. When they do, they will be hunting for quality content. That’s not to say that the content on channels like Blip.tv and CNet isn’t good. Many of the offerings that you get free on a Roku can be quite good. As a comic geek, I love watching iFanboy on my Roku. But sometimes you just want to watch a well-produced network television show, since the conversation around the watercooler tends to be about those shows. NetFlix now has CBS and ABC content, which makes it a bit more competitive with Hulu, which has ABC, NBC, and Fox. I am in love with another. And like a bad romance novel…I love your sister, Kindle DX. Your sister Kindle DX…where do I start? I fell in love the first time her picture was leaked on CNet. She’s thin and white, just like you. I can see the family resemblance. But she’s tall and really easy on the eyes, if you know what I mean. And compared to your perfectly acceptable QWERTY keyboard, her ergonomically cute button keyboard seems so…I don’t know…futuristically relevant? Is futuristically even a word? I will have to check my Kindlictionary. Yes, good. Words matter. Anyway, DX does things for me that you just refuse to do. And I have needs. For example, DX supports PDF right out of the box. You may not think it’s a big deal to convert to PDF, but…she just knows how to do it automatically. I don’t even have to ask. Speaking of needs, she can rotate my images just like my Apple iTouch. And while you hold an impressive 1,500 books…she’s deep enough to accommodate 3,500 books. I don’t know why that matters…since I don’t even have that many books…but I guess I am just impressed by girth. Well, that’s it. Please don’t hate me. I do not hate you. I just found someone I like better. Don’t dwell on the fact that she’s younger than you. There are so many things I will cherish about our relationship. And until DX comes out, I’d like us to remain “friends with benefits” okay? Kindle DX: A Digital Comics Platform? As the bad economy grinds on, there are massive shifts in all industries. Many good websites have been funded (in part) by advertising, venture capitalist funds, and subscription models. But as these revenue channels evaporate (for some websites), we’re seeing a shift in the Net economy. Good services need to find a proper revenue stream. And…get ready, gang…some of these websites are going to eventually charge a fee. Apple’s iTunes Store and Amazon’s Kindle 2 are slowly making it possible for certain sites to turn a profit on micro-payments. But those sites sell stuff. For other sites, we’ll see a greater emphasis on Freemium models. Yes, I know email is free. But I would be willing right now to pay for GMail, if it promised greater security and features. They provide an awesome service, but we’re still computing in the cloud, which makes email particularly vulnerable. Think about how many emails you’re getting that could be giving tiny bits of financial, health, or security information away. I’d pay to upgrade to something that would offer a greater level of security and privacy. The Obama administration has placed a strong emphasis on building up the infrastructure of our health system. With that is an even stronger focus on electronic medical records (EMR). Right now there are several companies offering free EMR tracking solutions, including Google, Microsoft, and some health insurers. They’re going to have to get paid from someone, and if they’re not charging YOU for YOUR information, where will they get their money? I’d pay for EMRs that hire good quality employees and conduct full background checks. In the old days, professional journalists were hired to be product and movie review experts. There was an editorial system of checks and balances to ensure that newspapers and magazines were unbiased. Consumer Reports was famous for not accepting any advertising, so you had to pay for their reviews. Now, to be a reviewer, all you really need is an opinion and an email address. There are hundreds of sites hungry for content, so they accept submissions from reviewers with no experience. These reviews may be spot-on or they may be looking to build a personal network, reputation, or whatever. In my experience working in pop culture, I’ve found that SOME reviewers are frustrated creators, offering opinions on stuff they think they can do better. Not all, some. But it’s that minority voice…the one with an axe to grind…that can damage a creator’s career and reputation. So I’d be willing to pay for reviews on a site where professional reviewers were (a) experienced, (b) unbiased, (c) well-rounded, (d) had editors, and (e) were paid for their professional opinions. Check out Johanna Draper Carlson’s article How to Review. 4. Cloud Computing & Software as a Service. My trusty old G5 Mac is still running classic boxed software. But as the line begins to blur between the desktop and the web, we’re seeing better software options. Right now, Google, Microsoft, Zoho, OpenOffice, and a dozen other sites are sharpening their software solutions. Eventually, as things shake out, we’ll see some clear leaders. Personally, I enjoy having my Microsoft Office 2008 for Mac . It works, even when my Internet connection doesn’t. Google Gears is already offering a similar solution, but it’s just not as robust as I’d like. Some people find the deep tools on Word and Excel to be overkill for their needs. Not me. I use power tools and look forward to the features that some people deride as bloatware. To me, these improvements are essential for solving editing, analyzing, and other business challenges. I would pay if Microsoft, Zoho, Google, or anyone could offer me (a Mac user) a full software solution with a reliable bridge between the desktop and the web. Right now, nearly everything I consume online is free. News, videos, professional development…all free. Pretty amazing, considering how much it costs to create good quality content. Eventually, this model will change. Maybe ads will pay for everything, which would be like the broadcast TV model. Or it will move premium, like the cable TV model. Either way, someone has to pay for the content I want to consume. For example, I go to CNet nearly every day for tech news. CNet is an essential part of my need to stay on top of tech trends, so I have a professional motivation for keeping up with their content. And given the choice of seeing my favorite sites go out of business or paying a small subscription fee…I’ll pay the subscription. Of course, all of this excludes services and content I already pay for, including music on the iTunes store and books for my Kindle 2. If the Internet moved to a pay for service model, what would you pay for? Oh, and one more thing. I tried to come up with a Top 10 list. The most I could come up with was my Top 5. Tells ya something, right? How can newspapers help Google? In a previous post, I blogged about Podcasting Your Brand Message. Check it out. Go ahead, I’ll wait. Basically, podcasts are highly specialized radio shows that people subscribe to on their computers. You can listen to podcasts on an iPod, burn it to a CD for the car, or just listen on the computer. Many podcasts are highly specialized, serving a niche audience. Check out the massive variety of shows at Podcast Alley. My favorite tech podcast is CNet’s Buzz Out Loud. Although the “podcast of indeterminate length” runs a little long, it is always interesting, always educational, and…always about new technology. The people who are listening to a one hour plus podcast about cutting-edge tech are probably receptive to…I dunno…an ad for a website that sells new technology at a great price. The absolute best podcast on screenwriting is called “On the Page.” Each week, Pilar Alessandra offers smart, actionable advice to aspiring screenwriters. As a writer, I am also an avid reader, so I would like to know if an interesting new writing book becomes available. Yes, it would be very smart to advertise a the right book on a targeted podcast, especially if the show discusses topics relevant to writers. These are just two examples of podcasts perfect for highly targeted advertising. It’s a lot like speciality magazine advertising. That is, when I subscribe to Popular Photography magazine, I expect to see ads for photo equipment, services, and other cool photo stuff. I spend as much time drooling at the ads as I do on the reviews. Sometimes more. Podcasts offer you an opportunity to connect your product with people who are passionate about the category. With tough times ahead, advertisers want unique opportunities to connect with their customers. Many niche podcasts have a small staff, but a large, dedicated following. This means a podcaster probably doesn’t have a sales force to come and woo your ad dollars. The Internet is reversing that model, and now you are going to have to find them. The payoff could be huge for your brand. Instead of an apathetic audience, you could be tapping into passionate, motivated audience eager to buy your product or service. In the meantime, I’ll just be listening to ad-free podcasts…and hearing nothing about your brand. Got an email alert this morning from Cnet.com, as I do most mornings. Highlights, interesting tech tidbits, and other stuff I sip with my coffee. 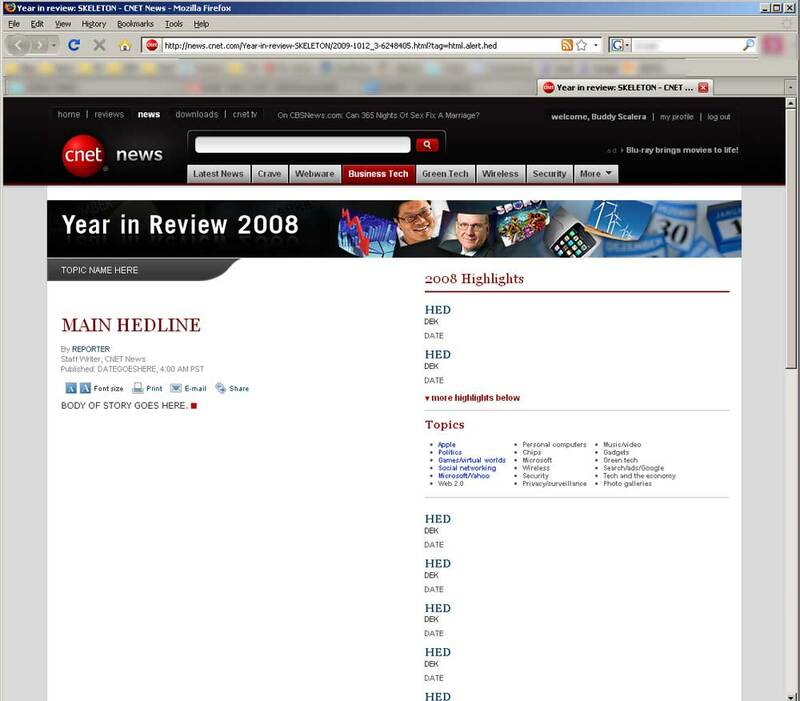 Today, Cnet announced the Year in Review. Cool. Except…the headline was “SKELETON.” Hmm. Intriguing. Skeletons in the closet? Is Skeleton some new software? Skeleton trend? 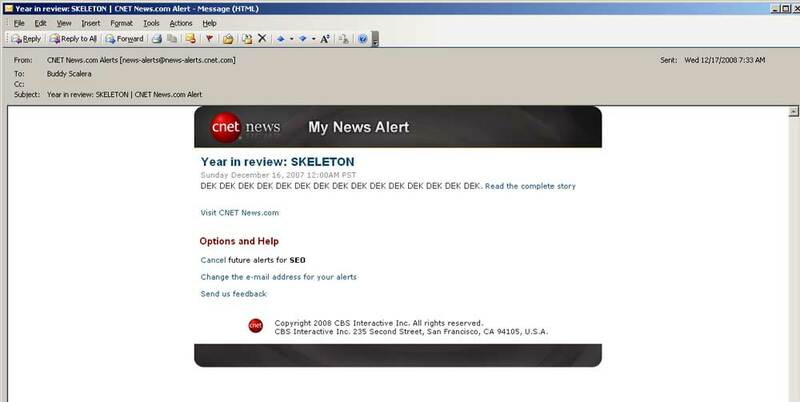 Inside the email, SKELETON revealed to be “DEK DEK DEK DEK.” Huh. Cryptic. Some sort of insider tech talk? A Cnet digital chant? On the website, things got even weirder…the DEK DEK DEK began to mix with the HED HED HED. Ah, got it. In 2008 DEK DEK DEK always gives you DEK DEK DEK. If none of this makes sense, well, that’s because you haven’t look at the screenshots below. Hey, if I don’t see you, have a very HED HED HED day. And don’t step in any DEK DEK DEK. Oh yeah, and be sure to check out “Tissot Thinks I’m a Dummy” too. CNET Says "Dek, Dek, Dek"